Rare Birds is a tale of obsession, of hope, of fighting for redemption against incredible odds. It is the story of how Bermuda’s David Wingate changed the world-or at least a little slice of it-despite the many voices telling him he was crazy to try. This tiny island in the middle of the North Atlantic was once the breeding ground for millions of Bermuda petrels. Also known as cahows, the graceful and acrobatic birds fly almost nonstop most of their lives, drinking seawater and sleeping on the wing. But shortly after humans arrived here, more than three centuries ago, the cahows had vanished, eaten into extinction by the country’s first settlers. Then, in the early 1900s, tantalizing hints of the cahows’ continued existence began to emerge. In 1951, an American ornithologist and a Bermudian naturalist mounted a last-ditch effort to find the birds that had come to seem little more than a legend, bringing a teenage Wingate-already a noted birder-along for the ride. When the stunned scientists pulled a blinking, docile cahow from deep within a rocky cliffside, it made headlines around the world-and told Wingate what he was put on this earth to do. Starting with just seven nesting pairs of the birds, Wingate would devote his life to giving the cahows the chance they needed in their centuries-long struggle for survival - battling hurricanes, invasive species, DDT, the American military, and personal tragedy along the way. It took six decades of obsessive dedication, but the cahow, still among the rarest of seabirds, has reached the hundred-pair mark and continues its nail-biting climb to repopulation. And Wingate has seen his dream fulfilled as the birds returned to Nonsuch, an island habitat he hand-restored for them plant-by-plant in anticipation of this day. His passion for resuscitating this “Lazarus species” has made him an icon among birders, and his story is an inspiring celebration of the resilience of nature, the power of persistence, and the value of going your own way. Just a handful of people have seen cahows in flight, and even fewer have witnessed the staggeringly graceful, scramjet-fast aerial court- ship they perform on only the darkest fall and winter nights. Wingate, though, has spent enough time with the birds that he has felt their wings brush the top of his head as they darted past him in the black- ened sky, gliding ever slower through the air before dropping to land like a cartoon anvil. But in the past few years things have changed, and troubles from bad knees to bad blood have conspired to keep him from the birds he calls his first love. This week he’s supposed to make his first trip to Nonsuch at night in two years. He’d been trying to get out there--or at least into the harbor in his boat--for a night watch once or twice every November since he moved off the island in 2003, but last year he didn’t go because of the knee-replacement surgery that laid him up for six months and left six-inch vertical scars in the dead center of both his legs. Before that--well, it’s a long story. Mid-November is when the birds are most active, from a human perspective. It’s when the returning fledglings arrive at Castle Harbour after as much as four years spent flying virtually nonstop, drinking seawater and sleeping on the wing. During that time a young cahow might travel thousands of miles a week, weaving in and out among the rolling waves and heaving swells of the open ocean, alone feathered missile gliding and banking along the westerlies as it roams over millions of square miles of the Atlantic. Then, one day, a day like every other in the bird’s life so far, some unknowable instinct kicks in; some primal urge tells it to head back to Bermuda to find a mate. And, like a high school senior hustling to Cancun for spring break, it does. And when it arrives, it lands within three yards of the tree or rock or sheer cliff wall from which it fledged. When it takes off again to get to the business at hand, it rises and dips through the night sky and calls to its new friends in low, spectral moans until that special someone answers and the sexual chemistry becomes so achingly clear that the other birds must roll their eyes and tell the pair to get a burrow. Seeing that, to Wingate, is heaven, an adrenaline high like no other. But this week, as in Novembers recently past, the Fates are refusing to allow him his greatest thrill. First, there’s the weather, which is often unsettled in Bermuda this time of year. What the weather service describes as a “solid cloud deck” is hovering over the country; tomorrow it will combine with a low- pressure system from the south and the next day with the nor’easter created by what’s left of Hurricane Ida as it charges up the coast of the United States, generating a mini perfect storm that will result in near-constant rain, winds gusting to 33 miles an hour, and a total of just a few hours of sunshine over the next three days. The small-craft warning that will be issued for each of those days would most certainly apply to Wingate’s battered 17-foot Boston Whaler--not that that sort of thing usually keeps him out of the water. Far worse than the weather, for Wingate, is that he threw his back out yesterday after having to bail his boat with a hand pump because the electrical system’s on the fritz again. (Covering the boat while it’s moored, he says, is “too much trouble.”) He turns into the parking lot of a bungalow-style pink building called Shorelands, which houses the Bermuda Department of Conservation Services, and slowly begins to extricate himself from his sardine can of a car, the smallest he could find in the country. He’s here to go through two plastic storage containers full of old photographs to select some for a Canadian filmmaker who’s in town shooting the cahows for a DVD series on the environment. But Wingate can’t carry the bins. He can barely make it into the building. He hobbles up the sloping lawn and, once inside, leans on any available surface as he plods forward, wincing and groaning all the way. At seventy-five, Wingate is a trim six feet tall and broad-shouldered, with a full head of uncombed white hair, thin lips, watery blue eyes, and the slightly crooked teeth of a British schoolboy. He has a short beard, also white, and his dress is emphatically casual, tending to- ward shorts, polo shirts, and boat shoes or Crocs for all but the most formal occasions. Like most Bermudians, Wingate speaks with a mix of accents--in his case, Scottish, handed down from his father’s side, and English, from his mother’s. Thus his nasally cannot becomes canna and glasses something like glahshees. Though most people pronounce the bird’s name ka-HOW, as in “How now brown cahow,” Wingate more often says KA-how, rhyming the first syllable with the vowel sound in the American pronunciation of laugh. He had a skin-cancer scare last summer when he developed a per- sistent sore on his lip. Though a biopsy proved negative, just to be on the safe side he cut out a rectangular piece of cardboard and affixed it, dangling, to the back of his baseball cap with blue painter’s tape. On cloudless days, he works the thing down over the bill of the hat, past his wire-framed aviator-style bifocals, and over his mouth, where it jumps slightly whenever he talks. When asked why he doesn’t just use zinc oxide on his lips, he replies that he prefers a mechanical barrier. He’s thinking about replacing the cardboard soon with a leather version, maybe in the shape of a handlebar mustache--”to look like Mark Twain,” he says with a chuckle. “I think everyone, even his best friends, would say he’s, well, he’s not certifiable, but he’s certainly a genuine eccentric,” David Saul says of Wingate. Saul, a former finance minister, former premier, bird lover, and raconteur, is no slouch himself in the eccentricity department, with a specially made steel coffin--guillotine-ended for easy opening--accumulating coral while it waits for him at the bottom of Devonshire Bay a quarter-mile from the backyard of his house. Saul can’t recall any particular anecdotes to back up this assertion. I was late for school, and found it a most miserable day, because the whole sixth form joked & laughed about my bird-watching as though it was a horrible crime. Wandering around with a notebook and binoculars, meticulously recording his sightings, he must have seemed hopelessly nerdy to the more sportive boys. But despite the mutual antipathy, he may even then have been beginning to earn their grudging respect, for in a place as small as Bermuda, it doesn’t take long to make a name for your- self. 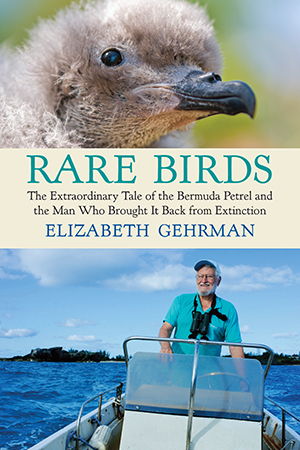 By age fourteen, Wingate was presenting the neighbors with gifts of his ornithological lists and diaries and getting phone calls from adults all over the island--including at least one from someone at the Bermuda Biological Station--to come and identify unusual birds for them. Wingate wasn’t always obsessed with birds, but he was preoccupied with the natural world from the time he could walk. At age three, he collected a herd of wood lice that he called his beesh, for beasts. He kept them in a matchbox and took them to bed with him, until his mother found them crawling all over the pillow. Chastened not by her disapproval--his parents were tolerant of his diversions--but by the possibility that she might expel his pets from their new homes, he simply relocated his menageries, catching bugs of various sorts and stashing them under the bed instead of in it. Occasionally a spider would escape and build a web over him as he slept. Wingate’s parents, a postal employee and a legal secretary, didn’t seem to know where their “born naturalist” came from, but were will- ing to indulge him, particularly as he was the baby of the family for thirteen years, until his sister Katharine came along. After a brief flirtation with astronomy--abandoned when, as he wrote in 1950, “I could not get the same thrill as I did before I found myself mak- ing silly blunders in judging the stars”--at age eleven his interest in the natural world took a turn toward birds. His older brother, Peter, had started an egg collection, which was a fairly standard pastime for Bermudian boys at the time, despite laws meant to protect nests from poaching.